Oooh, I hope you are ready for today’s post because it is a BIG one. We are starting to get into the nitty gritty details of Japanese patterns – the parts that make a lot of us cringe. But today we have Sanae of Sanae Ishida as our trusty guide and Japanese pattern sewing expert and we are SO lucky to have her! I was recently introduced to Sanae’s blog and have been hooked since day one. Her blog, her words, her photos, and all of her creations live in this perfectly simple space that just exude beauty and a sense of calm. I also remember reading about her and finding that we have a surprising amount of things in common. We’re both Japanese American, we both studied Communications (among other things) as undergrads at UCLA, we both lived in Japan and taught English there for two years before going back to UCLA for graduate degrees in the education field. She even lived in San Francisco for a bit. Our lives look pretty different now though, the biggest factor being that she’s about ten thousand times cooler than me. Not only is she a skilled seamstress (I think this post pretty much sums up her gorgeous style and straight up awesomeness), but she’s a true true artist. She writes, she paints, she sketches, has her own art shows, she knits, she bakes, and takes the most beautiful photographs. She’s the kind of person who I want to stand close to with the hopes of absorbing some of the talent and beauty that seems to ooze out of her. And you have to check out the incredible “100 Dresses” art show that she put together with exquisite toddler dresses made by her mom (I guess we know where Sanae gets it from!). It really is one of the most unique and amazing things I’ve seen! Ok! Without further ado, I’ll let Sanae take it away . . .
Hello, lovely You and Mie readers! I’m Sanae of the oh-so-originally named sanaeishida.com. On my blog, I prattle on about sewing and creating in general, and I’m so pleased to be part of the Japanese Sewing Book Series! I’m a huge fan of Japanese sewing books and have amassed a lot of ’em over the years and frequently use them to sew outfits for my six-year-old. This is my very first guest post so I’m doubly excited to be here! I’ve also created two outfits to accompany this post on my own blog, and I hope you’ll get a chance to check them out. Today, I’ll be covering the basics of the text that you see in the beginning (or top section) of the pattern instructions. The pattern instructions themselves are typically located at the back of the book. See Exhibit A below. If you don’t read Japanese, it all probably looks like gobbledygook, and I hope that I’ll be able to make that portion a bit more accessible. One thing you should know about me is that I can only read at about second grade level in Japanese so I’m actually not completely literate in the language. Which means that I’m familiar with that head-scratchy feeling of, “What in the world? ?” and have had to figure out a lot over the years. Lots of information coming atcha, so you might want to grab a cuppa…Without further ado, let’s jump in! Pattern Identifier – This is usually a letter or number and you will use this identifier to locate the correct pattern pieces on the crazy pattern sheets provided with the sewing books. Garment Name – These names tend to be very straightforward descriptions like “peter pan collar shirt”, “skirt with pockets”, “camisole dress”. You usually won’t find any cute or pun-ny names. Finished Measurements – Basic finished measurements are provided and usually includes length of garment, chest circumference, sleeve length, etc. This section may also have the available sizing which is usually 90cm to 130cm. Kristin covered this information yesterday. The sizing info is also often included in the Materials/Supplies section. 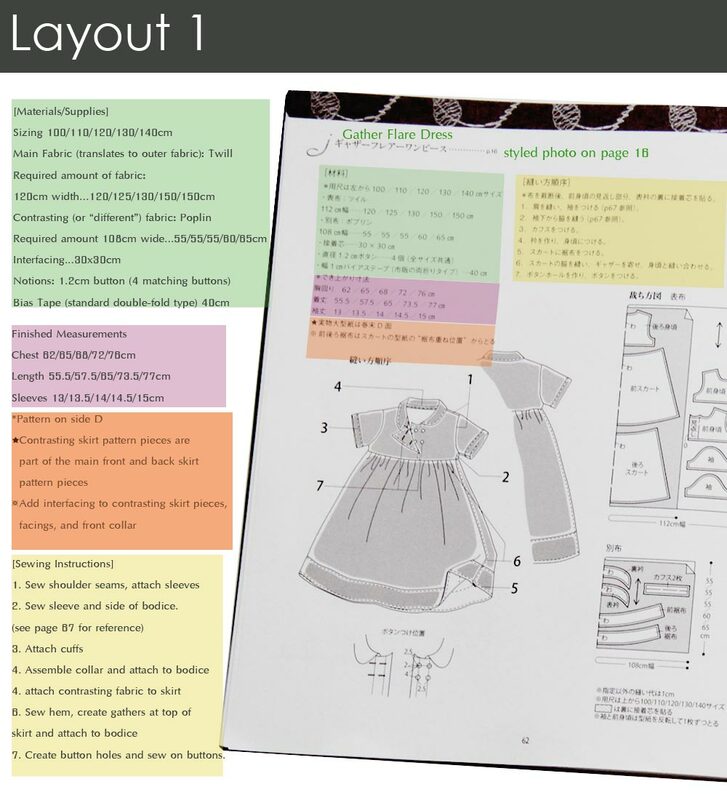 Pattern Info – This section will indicate the pattern sheet on which you will find the necessary pieces (e.g. in the image above, the pattern pieces for the skirt is on sheet 2). The books usually come with multiple pattern sheets. 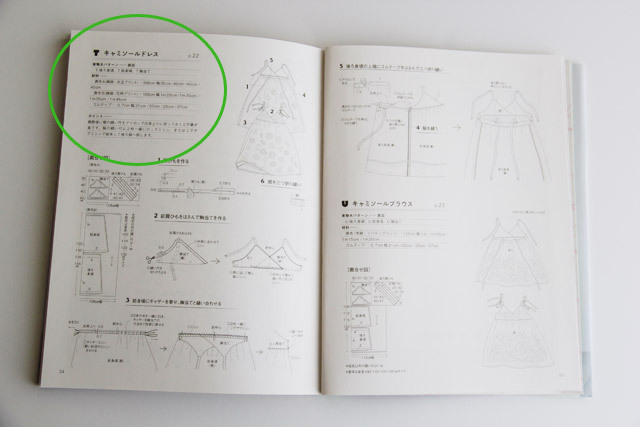 Some books also list the pattern pieces specifically such as “2 collar pieces, front bodice, back bodice, sleeve, facing”. Materials/Supplies – This is where fabric and notions information will be listed. The quirky thing about Japanese sewing books is that they don’t really offer recommendations for fabric options. They list the exact fabric that was used for the garment featured. So instead of a list of fabric recommendations as you would see with American or European patterns, this section will list “Liberty Tana Lawn” or “Striped yarn-died cotton”. It’s interesting to see what they used, but I usually completely ignore the fabric section. Rather than spending time trying to painstakingly translate every part of the fabric listed, I would merely try to see if one of the common fabric types was used (I talk about links to a dictionary of sewing terms in the next section). One other thing about the fabric section is that the amount of fabric required is also listed in Japanese standard widths (110cm usually). The numbers separated by slashes tell you how much length you need for the size you are making. So if the sizing available is 90/100/110/120/130cm and the fabric requirement section shows 45/50/55/60/60, and you’re making a size 90cm shirt for your wee tot, you’ll need 110x45cm in fabric. Prep & Tips – Not every book has this section. The prep & tips section advises on things like adding interfacing, finishing certain seams beforehand, etc. 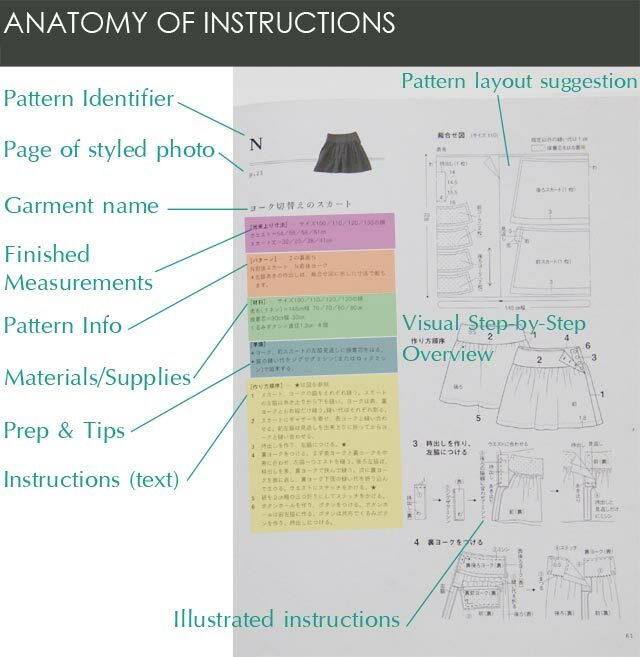 Instructions (text) – These are the step-by-step instructions to construct the garment. These steps correspond with the illustrated overview with the numbers that indicate construction order (see below). I should point out that not every step has a detailed illustration, except for A Sunny Spot and Happy Homemade books which omit this texts instructions section and literally has step-by-step written and illustrated instructions. Note: Keep an eye out for any page numbers in the instructions as they are references to illustrated instructions to help you. For example, if you’re sewing a shirt with a placket and you don’t see any illustrated guide to how to create the placket but you see “p.57”, go to page 57 and you’ll find the illustration there. 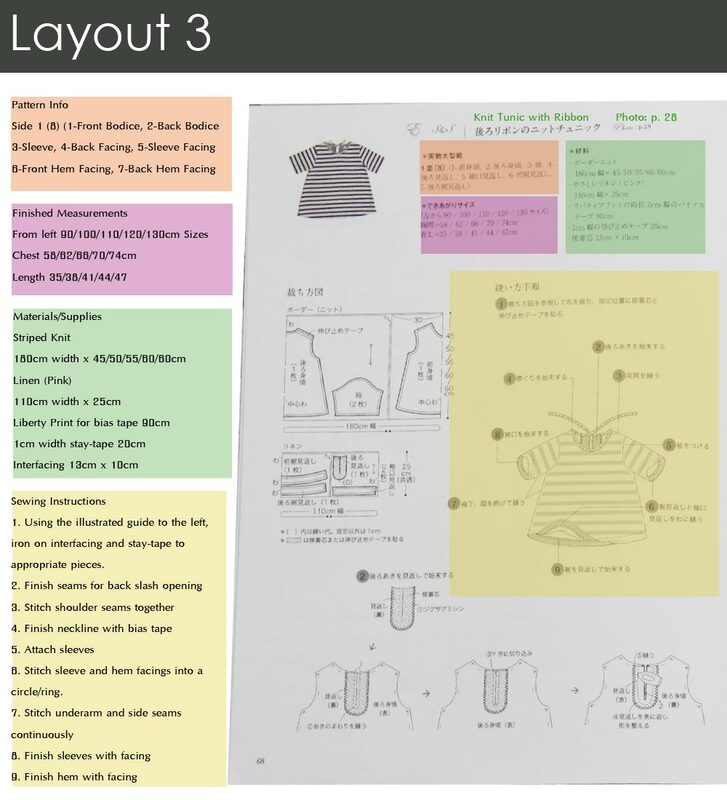 Visual Step-by-Step Overview – As mentioned in the text instructions section above, this is where you can see at a glance the construction order of the garment, and the numbers correspond to the steps in the text instructions section. Illustrated Instructions – The illustrations are excellent, and I find that this is the section I really use above any others. More on this later this week! 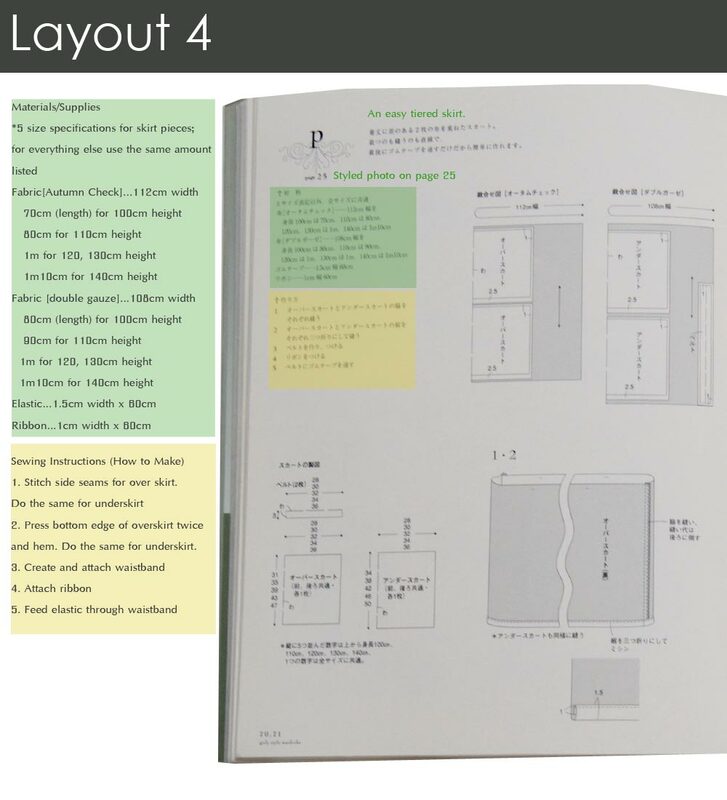 I was going to create a glossary of terms, but realized that Japanese Sewing Books has already done an excellent job, and you can find her translated dictionary of terms here. It’s a great compendium of terms with pretty much everything: fabrics, garment terms, measurements, general sewing terms, etc. etc. There are a couple of small errors in the dictionary, though. 衿 is listed as “neck” but should actually be “collar” and 襟 is listed as “collar” but should be “lapel”. Many Japanese fabrics are 麻綿 blend and I find that 麻 is very commonly mistranslated as hemp, and a dictionary search shows that asa is hemp, linen, ramie, and so on. 麻 is just a term used to cover many textiles made from plant fibers, but the Japanese fabrics most people have access to (for example the blends from Kokka) are cotton – linen, not cotton – hemp. 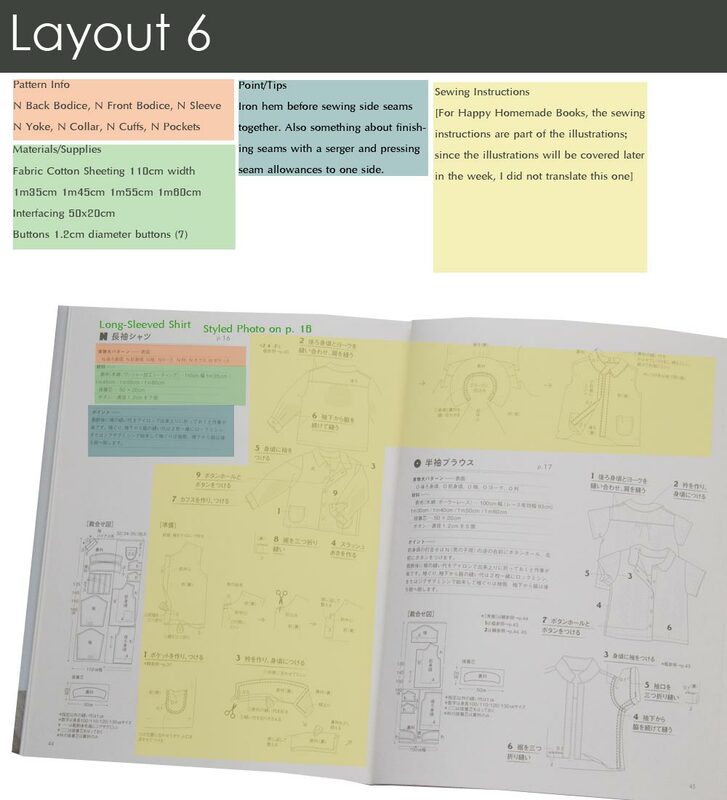 So I went through all 14 of my sewing books and identified six main instructions layouts, and you can see the first one above. I also included the books that have the same layout; click on the numbers for details on the books. The other 5 layout images are below. I quickly translated these six, and chances are good that you have one of the fourteen books that I own. Or, if you don’t own any yet, these are the ones that are typically available, so this should give you a pretty good sense of how to find information on the instruction pages. They’re even color-coded! There you have it, whew! Did you make it through? Was this helpful? Please feel free to contact me with any questions you may have. Sewing with Japanese patterns, though seemingly labor intensive, is incredibly rewarding. The designs are simple yet stylish and fit very, very well. I sew almost exclusively from Japanese Sewing Books and love them more and more and I hope you will too! Thanks so much for having me Cherie! Isn’t Sanae incredible!? And she’s sewn up TWO new outfits to share with you guys over on her blog, so head over there to check them out! And I’m betting you’ll stay awhile to browse through all of the other gorgeous things you’ll find over there. Tomorrow, we’ll be tackling how to find the pattern pieces you need on the pattern sheets and adding seam allowance. You won’t want to miss it! Hey guys – thanks so much for the heads up. The pictures should be working now!! Hi Ann. I do think that a lot of it will make more sense when you have a book open in front of you and you’re working on a specific pattern, so definitely pull it up again when you’re at that stage. Also, when you were looking at the post earlier I suspect none of the images were showing up, but they are back up now and should help you understand the text a lot better! Thanks for stopping by! Oh such a pity that Sanae’s site is down at the moment! This series is so interesting, I wanted to check out her work too 🙂 Thanks for sharing this, that’s an inordinate amount of very thoughtful work. Such lovely pieces to sew and such pretty fabrics you guys are using! Awesome, super helpful, detailed, info-rich post! Thank you so much Sanae! Bummer about Sanae’s site still being down but I will be sure to follow and comment when it’s back up! Wow. What a lot of great info. I am still intimidated but I really want to try. Sanea is like the new really cool kid on the block. Woah, thank you so much for this hugely detailed post, Sanae! Definitely will be referring to this in the future. Hope your site is fixed soon, everyone needs to see how wonderful you are!! Hi everyone! I’m SO sorry that my blog is down — apparently my server died this morning. How’s that for timing? It’s going to take a couple of days to re-build, fingers crossed that I haven’t lost all my posts. Again, apologies for any confusion I might’ve caused. Cherie has been an angel through all the technical difficulties! Despite hiccups, thanks for including me in the series, Cherie! The sneak peek you gave us at the end of your post has me eager to see even more. 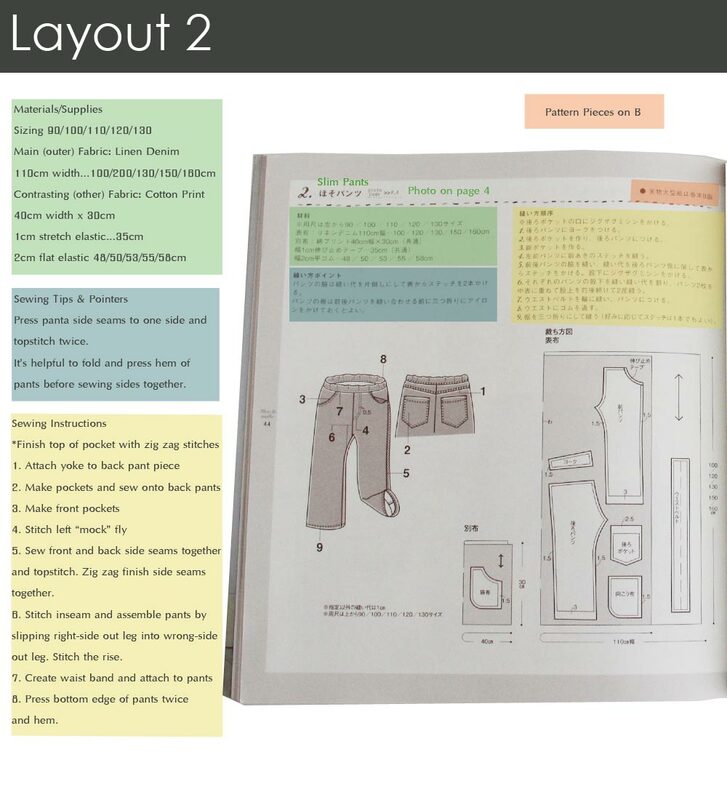 You are a wealth of Japanese sewing pattern information. I’ve been winging it all these years with moderate success, but now understand so much better how it all works! Thanks for all your work in preparing this. Hoping that the server issue will be fixed soon with no posts lost. Okay… I am bookmarking this post for future references when I’m sewing. Seriously. Back to see it with pictures. Wow! What a beautifully written, well illustrated post. Congratulations. I’m having fun sewing along with you. This is incredibly helpful information, and grouping different Layouts together is a great idea and worth all the time it must have taken Sanae. This is so freakin fantastic!! I’ve taken classes on all this before, and the way that you outline it here is perfect for those who haven’t had the unique experience of taking a class. LOVE this series!! yes, sanae is incredible!! i’m so excited to have this wealth of info all in one place. great series, cherie!! 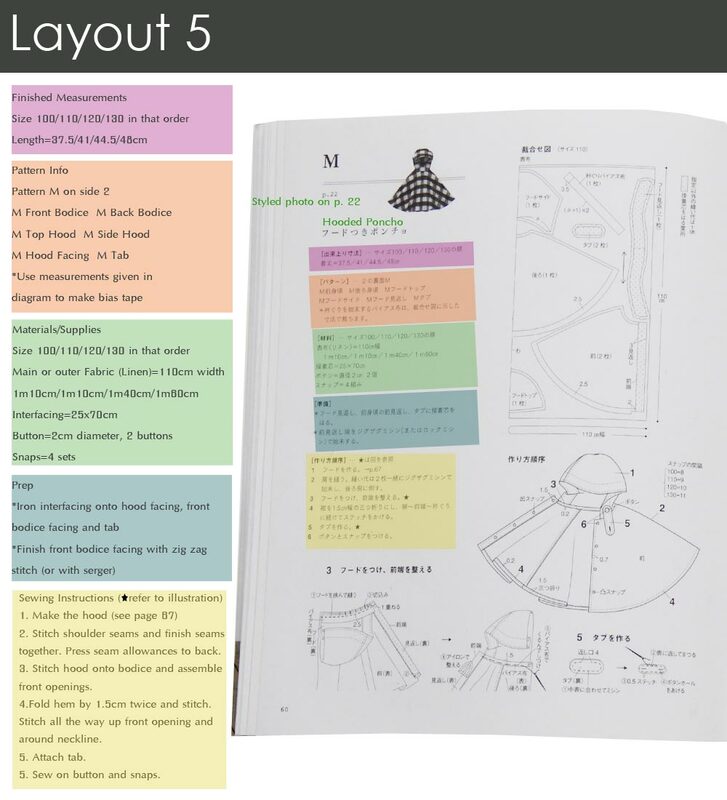 Wow, this is really a detailed breakdown of the pattern books and I can tell how much time and effort it must have taken Sanae to create this post.